"It's a marshmallow world in the winter..."
I don't have a Facebook account, so I thought I'd throw in a few photos for the relatives. Or anyone who lives in a place without snow! 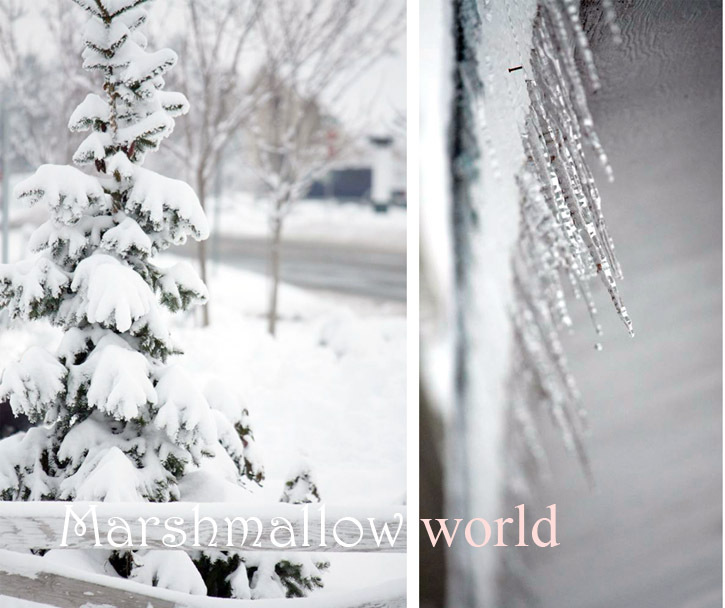 :o) I honestly think I could live in snowy conditions all year long. I know it's frigid and sometimes quite dangerous, but I'm not sure any other weather conditions can compete with the beauty of a snowy landscape. It makes everything so quiet and calm. Like the whole world is just getting along peacefully for a few moments. If you're in a snowy place right now too, I hope you're enjoying it safely! Wow! Beautiful photos! Your little sweetie is looking so grown up and her hair is getting so long! what gorgeous snow day and yes I agree with you about how the snow makes the world quiet and peaceful. I have stumbled on your blog a couple of weeks back and I just eat it up. Keep up the wonderful creativity and gorgeous photography, so very inspiring! Wow. That snow and ice looks beautiful. 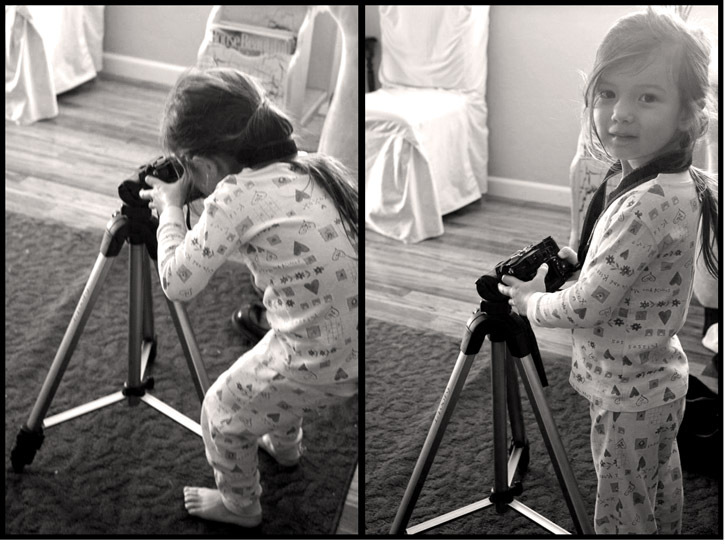 Hahaha, I just took some pictures of the baby in front of the tripod at the lowest height like that, except it's more her eye level. I don't have a facebook either! Wow, so great to know that not EVERYONE has one. Love the pictures. Your take on snow is a lot more peaceful than mine! i would live in snow forever too! so jealous we have none and I really want some!! Oh dear, not so much fun, I had an accident on saturday because of snow... today I have to work under the snow and I would like to stay home but you know no work -no momeny. Snow is beautiful in itself but so dangerous at the same time. love the pics! gorgeous! and paige is too cute! Ah, Disney! You have one adorable daughter! She is gorgeous. And the snow does make everything so quiet and calm and BEAUTIFUL. I really hope it snows here again soon. "It's a whip cream day..."
I love that song!!!! :) Great photo's too. I´m Norwegian, and it's a lot of snow here too! It is beautiful, but I know I start longing for spring in February :) Wishing you a nice day! Such a beatiful snowy days you have out there. And Paige looks cuute! As to snow, where I leave is rarely see (for my husband and daughter's sadness), but I'm ok with it. 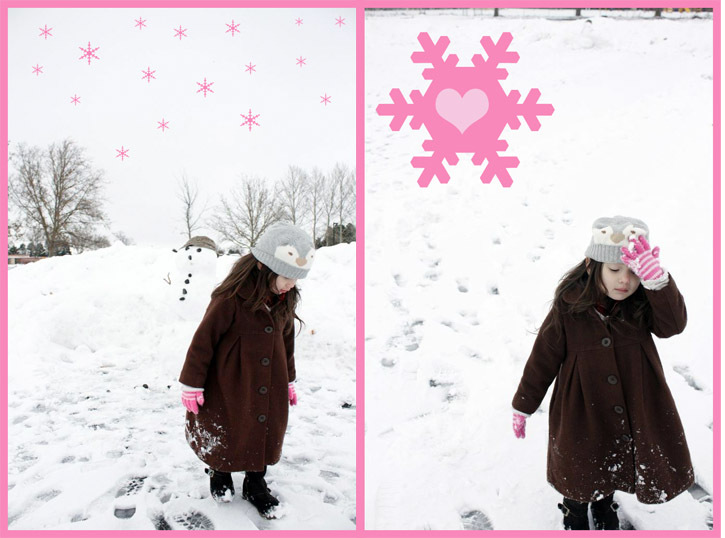 I love snow in the pictures (yours are gorgeous) but the actually thing...brrr...too cold!!! I wish it would snow a little here. Your pictures are gorgeous and miss paige sure is growing up fast! She is beautiful!! Glad you are enjoying the weather. Although the snow is nice to look at I'm definitely not jealous I'm missing it. Beautiful pictures Disney! im in a snowy place! :) disney, what kind of camera do you use? i always love how crisp you pictures come out. It's super COLD here, but not much by way of snow. After seeing these pictures though, I'm so going to take my kids out for a photo session. Your daughter is too cute! i agree! i love and miss the snow! we lived in the snow for several years and i LOVED it! people think i am crazy, but i love the cold and i love the snow and i love snowshoeing and i love hot chocolate! these are adorable and wonderful photos! Oh, and Ashley: I use a Canon Rebel xsi. Which I really should thank my readers for, because I used the money from all the necklaces you all bought (when I had an Etsy shop) to buy it! So thanks!! I'm not a frequent commenter but I love your surprise posts -- and I read each one first, as soon as I see it in bold on my reader. Thank you so much for sharing your little slice of the world with us -- even though it's just when you get the chance. Oh man, she's getting big!!! Mark said he LOVED seeing her when he was over a while back. You guys need to come over so we can sit in front of the fire, drink tea and let the kids play! =) We have a bit of snow but thankfully, none on the roads right now. I cannot wait until winter is over!!! We miss you guys! I'm so glad I'm not the only person without a facebook account! If you don't have one then I know I must be cool to be facebook-less, too! =) Wow, Paige is looking so big! She's growing up lickety-split style! 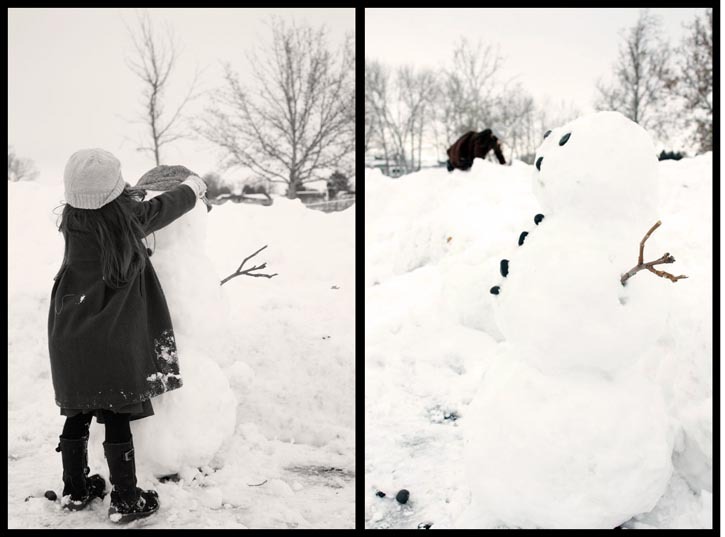 (I know, way too many exclamation marks!=) Thanks for the snowy pics - we don't get much where I'm from. I love, love the snow! Stay warm, stay safe! I don't mind being cold..as long as there is snow :) BUT we hardly get snow out here in Texas! So I very much enjoyed your beautiful (and white) pictures! Thankyou for sharing! your daughter is just beautiful! LOVE the black and white of her beautiful face while playing out in the snow!! These photos are gorgeous! I'm glad you are enjoying your show! Ours in S.E. Idaho is almost gone...home it's back for Christmas! Happy Holidays! SO glad to see a tute from you. You are in my prayers hun.. Funny how we can bond over a computer screen :-) LOL ! THANKS.. Vegas over here and we definitely crave this weather. 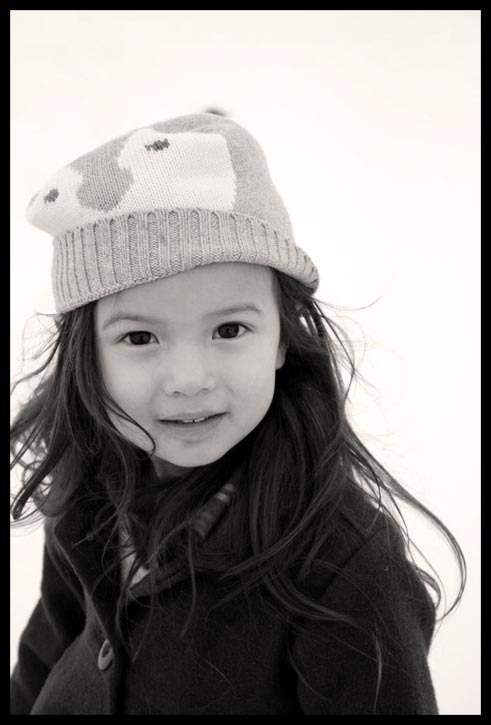 Something dear to my heart about the song "dreaming for a white christmas"
Your little girl is seriously so adorable! Do you use photoshop to write on your photos? I love the marshmallow world song! -- YoJade from either sunny or rainy Singapore. Really lucky!! Yesterday we had snow in Rome! I was driving back home, carefully because I can't drive on snow..thinking of you. As usual it melted with stormy weather in the evening, but it was fun to see my 18months old daughter say "ooooh...ohhhhh" playing in the garden. Snow always warms the heart. Hi disney, This is the first time I have posted. I love your blog and I was very sad to see it go. I happened to stumble back upon your blog and seen you were back! those are very very cute photos! I absolutely ADORE Paige's penguin hat. Amen..it's like all is well with the world when it's covered with snow...peace and calm! I love your Christmas medley...sooo cute. What a lovely friend you must be. Oh my gosh Disney, you are such a great photographer!!! and you'll have to share how you grew your blog! I would love to do giveaways! PS Paige is ADORABLE in these pictures!!!! <3 Please tell Micah I said hi. We will let you know ASAP when we find out if Andy got the job or not! What gorgeous images! The one of your daughter face on is precious. What a wonderful shot you got of her. 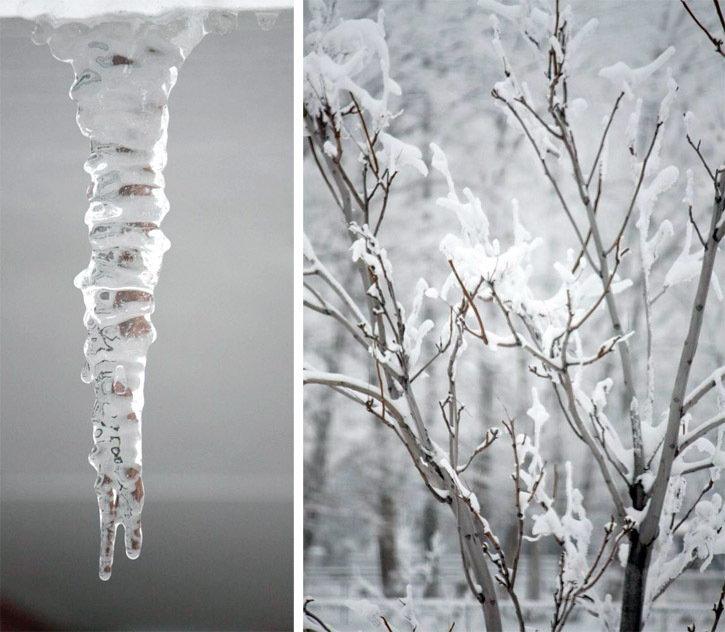 The icicle is really cool. I love the snow too!